Although some people foods are perfectly safe to feed, there also are a number of poisonous foods for puppies and it's important for owners to know the difference. Puppies can be ingenious when it comes to eating the wrong thing. It can go beyond the aggravation of eating poop, and can kill your puppy if you feed the wrong thing—or he gets into something dangerous. Beware of feeding too much fat. That can predispose susceptible dogs to painful pancreatitis, so don’t just reserve turkey skin, beef trimmings and gravy for Fido. Chocolate can poison puppies. Chocolate contains theobromine, a stimulant that puts dogs into heart-stopping overdrive that can kill. It also contains caffeine—and your puppy has enough energy without drinking or eating such stimulants. Too much sugar or salt isn’t good for puppies. Artificial sweeteners can be deadly, so beware treating with any goodies sweetened with Xylitol. It can lead to liver failure. Here in Texas, avocados are a staple of Tex-Mex food. But avocados contain Persin which can cause vomiting and diarrhea in dogs and even more dangerous signs in birds and rodent pets and may be fatal. Grapes and raisins can cause kidney failure in some dogs. We don’t know exactly why, but it’s not worth risking your puppy’s life. Nuts are a favorite at our house, but Macadamia nuts are forbidden. According to the ASPCA Poison Control, they can cause weakness, depression, vomiting, tremors, and hyperthermia in dogs within about 12 hours of eating them. So even though the puppy may beg for a taste, avoid treating with any cookies or other goodies that contain Macadamia nuts. Yeast bread is one of our personal favorites! Once baked, a small amount is fine for puppies as a treat, but keep the raw yeast dough out of puppy reach. The raw dough continues to rise inside the dog’s tummy, causing severe pain and in some cases death. Cooked poultry and pork chop bones splinter. They can poke holes in the intestinal tract and/or block the gut. Hambones can break teeth. It’s best to stick with commercial chew objects recommended by your vet that won’t hurt growing puppy teeth or get him in trouble. Dumpster diving pets get into difficulty eating leftovers that may be spoiled. 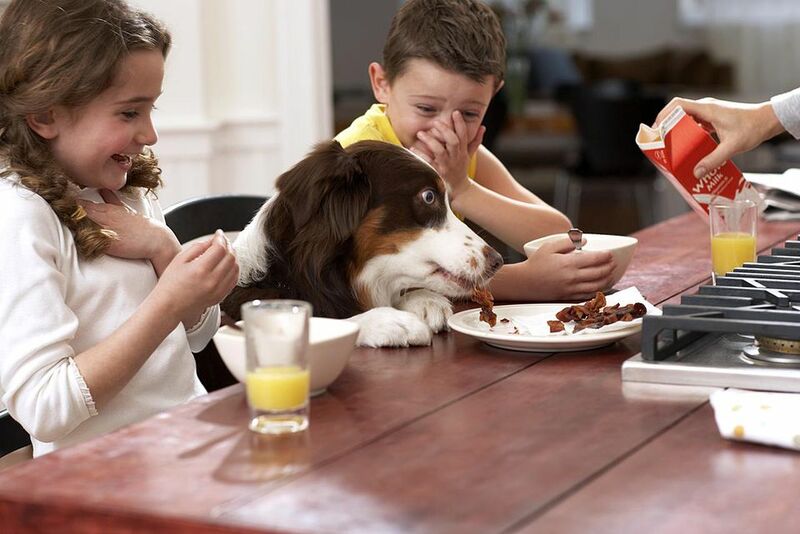 Puppies tend to be less discriminating about what they’ll try to eat. Pets are just as susceptible to food poisoning as people so don’t be tempted to feed the outdated leftovers to your furry crew. Dogs especially gulp down non-edibles such as aluminum foil, roast turkey strings or napkins when scented or flavored with gravy or grease. While corn from corn-on-the-cob is fine, eating the cobs can prove deadly. Make sure to puppy proof your house so the garbage can is out of reach, has a lid, or behind a latched door. unproductive attempts to vomit or defecate. By following the above tips and preventing problems your puppy will survive and enjoy the holidays and healthy treats all year long.